Standing just 8 stories tall on the beautiful sand of the Atlantic Ocean, Parker Highland is an upscale condominium building offering luxury to all of its residents in Highland Beach, Florida. Parker Highland is comprised of just 26 condos, making for an intimate style of living with the benefits of living in a condominium. Each spacious unit ranges in size from 2,000 square feet to 4,500 square feet and comes with elaborate features. 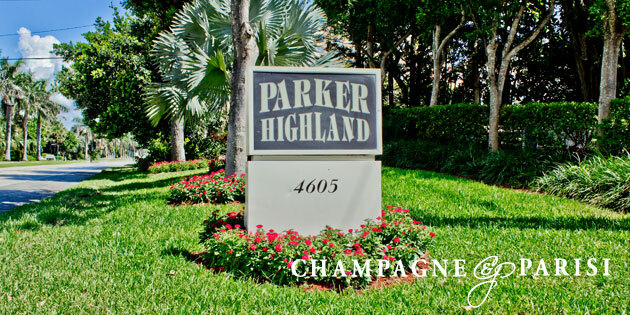 Parker Highland real estate is designed with large open floor plans, huge kitchens with granite countertops, high ceilings, expansive bedrooms, and new appliances. Enjoy spectacular views of the water from each units’ massive windows and private balconies. Residents at Parker Highland condos Highland Beach can enjoy resort-style amenities such as a private beach with lounge chairs, fitness center, sauna, club room, game room, billiards room, and on-site storage room. Parker Highland condo residents can also relax on the sundeck by the gorgeous heated pool, or gather together with friends and family at the outdoor barbecue area. The building is equipped with 24 hour security and doorman to ensure residents’ safety. Residents also have access to covered parking at Parker Highland. Living at Parker Highland condos Highland Beach you are also within a short distance from all the surrounding city activity. Between the famed Downtown Delray Beach Atlantic Ave, and Boca Raton’s well-known shopping boutiques there is fun for everyone beyond the beach. You will even be close to two international airports and major highways.